God’s Word collectibles are created through the inspiration of God by Bridgette Mongeon. 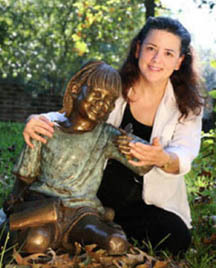 Ms. Mongeon is an artist, sculptor, writer, educator and public speaker. “I began a personal relationship with God when I was a teenager. Though, I remember, that even as a little girl having a yearning for the deeper things of God. My early childhood was a roller coaster ride shared with a family burdened by alcoholism, drug addiction, and poverty. Growing with my desire for God was my desire to draw, paint express myself. Ever since I could pick up a crayon I wanted to be an artist. The ability to express myself creatively in my art and writing, was considered by me to be a gift given from above, a sliver of peace, solitude, love. It kept me sane in the turmoil and gave me a focus. As I grew I shared that focus with my Lord and Savior. For years I tried to meld my relationship with God and my creativity together, it wasn't until the last ten years that I felt like that has been done. It was accomplished by simply releasing the one to the other. Thank you for sharing this web site, for allowing me to share the gifts given to me, and for cherishing God's gifts God's Word Collectible Sculpture Series. God's Word has been a chance for me to share so many things with others. My art and writing, and my love and passion for God as well as scriptures, that within the contents hold secrets to love, peace and everlasting joy and enthusiasm that so many see in my life and wonder about. I know it is difficult for some people to witness the word of God to others. The God's Word collectable sculptures make it easy. By simply giving a gift in love you are passing along God's Word. The cards that are included give the full scripture and my notes give a simple explanation of how that scripture is pertinent in my life. All that is included in a God's word gift box is more than most people can personally witness. You simply give the gift and let the sculptures the cards, my writings and most of all God's Word do the rest. I am so blessed to have the opportunity and the ability to work with people in capturing those things that are dearest to their heart.